The notion of journey as a visual paradigm for an information system is relatively new. Conventional wisdom says a serious information system user (i.e. Pubmed, Proquest, Web of Knowledge) satisfies information seeking needs in qualitatively different ways from an X-Box or Playstation game player. Rarely have these systems been spoken about with meaningful synergy in mind. Having said that, what are the possibilities of remapping current 3D online game paradigms onto serious ‘text’ based information systems? Can a visual 3D character based hunter/gather metaphor be applied to more serious information seeking (information foraging) purposes? Can this in turn be mapped onto 3D current first person seek and find/destroy paradigms? 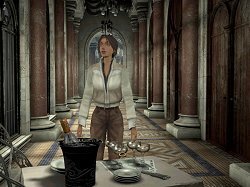 Kate Walker, a Lara Croft Tomb-Raider type 3D character rendering in the prize winning game Syberia, is an ambitious young lawyer in the small alpine village of Valdilene. Kate’s simple assignment is to find Hans Voralberg, the aging proprietor of an automaton factory. For information system designers, the trick is to take this ‘information gathering’ puzzle environment and map this onto more robust cognitive cartographies. Most online 3D games use a first or third-person perspective, mouse or specialized interface and controlled graphics environment. The user plays or directs a character as he or she tries to track another object/character down. Interfaces are largely intuitive; cursors interactively change to indicate actions, right clicking opens inventories – all is automatically updated and ‘saved’ as a character in a game learns more. 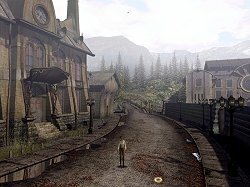 What are the possibilities of taking ‘the long scrolling’ text based ‘results’ paradigm of a search engine such as Google and mapping these onto this 3D engine environment? How can using a networked 3D online character as the ‘searcher’ enable epistemological horizons, allow us to envision new knowledge relationships and enliven and open the search process to new modalities? Solving puzzles generally fits well with online 3D networked games. In fact, many networked game environments provide user populations in the millions (i.e. Everquest, Morrowind). What we must begin to examine are similarities and differences in these collaborative puzzles’ and their confluence with higher order knowledge generating collaborative processes. Online games currently gross more than Hollywood. They are second in U.S. exports to defence. They deal with visual stories, polyphonic narratives and complex visual organizing metaphors in naturally intuitive ways. How can we now begin to apply and leverage these tropes towards information systems? On the whole. online 3D game puzzles are solvable rather than mind-bending. As long as a character searches his or her surroundings carefully in a 3D game environment there is little chance of not finding an answer. The 3D game paradigms being developed today are sensitive and intelligent information systems enhanced by a human user-centred design that children easily understand. As characters commence information seeking journeys they are concerned not only by ‘winning’ through ‘correct’ information but the information seeking journey itself. Current online multiplayer games provide extensive future network and collaborative possibilities. The 3D characters within cinematic systems and virtually realistic environments open the door to very interesting future information systems. Most 3D online games being developed today offer unthought out possibility for future information system development with an intriguing and compelling naturally human story that heralds nothing if not the future of HCI and ‘information visualization. 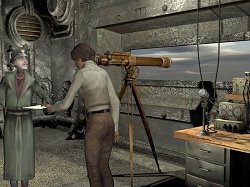 These games are enjoyable and largely unexplored by an older generation of information scientists who would benefit to spend a couple months with an X-Box, Playstation or Game Boy very much keeping visual synthesis and their own legacy systems in mind. I like your information I was looking information about Networked 3D Game Possibilities - Ray Uzwyshyn like that but I find it today and I feel very happy. maybe of concern to parents. great games for big consoles, I like many games that are mentioned here as a tomb raider and now in 3D does not even want to imagine want to play, good blog! conectada a Internet) y muy rentable saber procesar emails y se le pagara por ello. Usted ganara $18.00 por cada email que usted procese y recibira su pago dentro de 12 horas. ¡Si, en solo 12 horas! información y podrá empezar de inmediato a ganar dinero. Grissom shifted his eyes over at Brass, who was shaking his head back and forth knowingly. every time that I see a new game, movie or animation are more impressive, specially in video game world graphic technology advance in a incredible rate, only few years ago we was sorprised by the PlayStation and now when we remember that is like remember you grandpa, surely when children born holographic will be the boom in that moment. As with any other financial decision you make, it is wise to read the terms and conditions.